“Trigun”, based on the Manga from Yasuhiro Nightow (original creator of "Gungrave"), is a 26-episode TV series from 1998. In the distant future, mankind has set out on a mission into space to terraform and colonize a new world, planet Gunsmoke. The mission goes haywire when two sentient, humanoid, alien plant children are grown on the main terraforming spaceship, Project SEEDS. Though befriended and raised by the female scientist, Rem, the brothers, Knives and Vash, are feared and shunned by the rest of the crew. Knives, who views himself and his brother as superior to the petty, fearful, and selfish nature of Man, secretly sets the ships on a collision course with the planet below in order to kill the humans and prevent them from colonizing Gunsmoke. 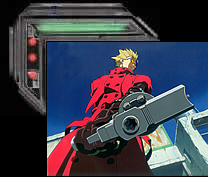 Rem saves both Knives and Vash by placing them in an escape pod, but stays behind in order to alter the trajectory of the spaceships to protect most of the settlers, perishing as her ship burns up in the atmosphere. Landing on the planet, Knives continues to seek to destroy mankind; but Vash, influenced by Rem’s kindness and self-sacrifice, decides to protect these people, who mistrust him, and whom he will never really be able to join. 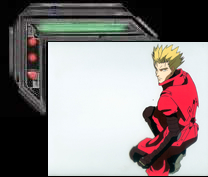 Years later -- Vash is missing parts of his memory, and hiding his inner turmoil under the guise of a guileless “Love and Peace” fool. As he travels across the only partially terraformed, wild-west, desert planet Gunsmoke, he protects the downtrodden, and observes the often contradictory nature of the human settlers and their descendants (especially shown in the interaction with the fallen-away priest, Wolfwood). In Trigun’s sci-fi world, it’s completely understandable that Knives wants to wipe out mankind. Because both he and Vash really aren’t part of humanity and really are humanoid plant monsters, from their standpoint, eliminating Man could be seen as the correct choice. 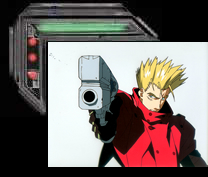 But Vash wants to live by his own absolute moral code: to protect everyone and never kill anyone, no matter what the circumstances… or the consequences. The settlers continue to eke out their trying existence, in ignorance of the quasi-immortal plant brothers’ continuing feud to either save or doom them. It’s a very interesting and thought provoking series, surprisingly presented with a lot of humor. 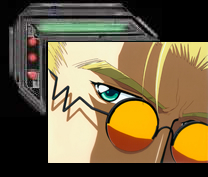 Vash is followed by two hardworking insurance agents, Meryl and Milly, who must continually submit insurance claims to their company as Vash engages in massive property destroying battles with various foes; from Knives’ super-powered henchmen, the Gung-Ho Guns, to ordinary greedy citizens, hoping to collect the $$60,000,000,000 bounty on his head.